Jes opened her talk with a compliment to British men. Style in the UK, she says, is great. Ed Sheeran is her favourite example, with his checked shirt – and she says that trying to buy that shirt is a nightmare that’s plaguing the ecommerce industry. Image SEO, she says, is the big pink dinosaur in the room. We don’t really want to talk about it, because we’ve never seen a real return. The fact is that image SEO has often been an afterthought. But Google’s trying to change that to improve its own image recognition. We are now at a point where computers can recognise visual content and use that; they’re not longer reliant on us correctly tagging up our images. This means visual search is a new opportunity for us as SEOs. And it can get us past the inefficiencies of using text based searches to find images – so we can find that Ed Sheeran shirt quickly and easy. An image, says Jes, is worth one thousand keywords. An image is not language specific, either. Your images aren’t in one language, they can be understood by everyone. That said, visual search is primarily used on mobile – little point doing it on a desktop, for obvious reasons. Similar items pulls out elements of an image and helps you find similar items. It also released ‘style ideas’, whereby images are shown to help you style an item. Image badges show you what kind of content you’ll see if you click on the image. 11% of searches have an image block now. It’s not just happening where you’d expect, like product queries. It’s also coming up for informational queries. Google is educating us to be able to shop on its platforms. Jes looked to Moz for their search feature report. She the image pack was one of the more common features of ecommerce queries. She asked her devs to do some image optimisation. The result? She is in position 1 for her keyword (including an image), and multiple times in the image pack, with labelled images and purchase details. It’s not only for ecommerce, either. She’s doing this for car clients, food clients and more. The impact is a 25% lift in image impressions in just 30 days. Action: Stop thinking only keywords. 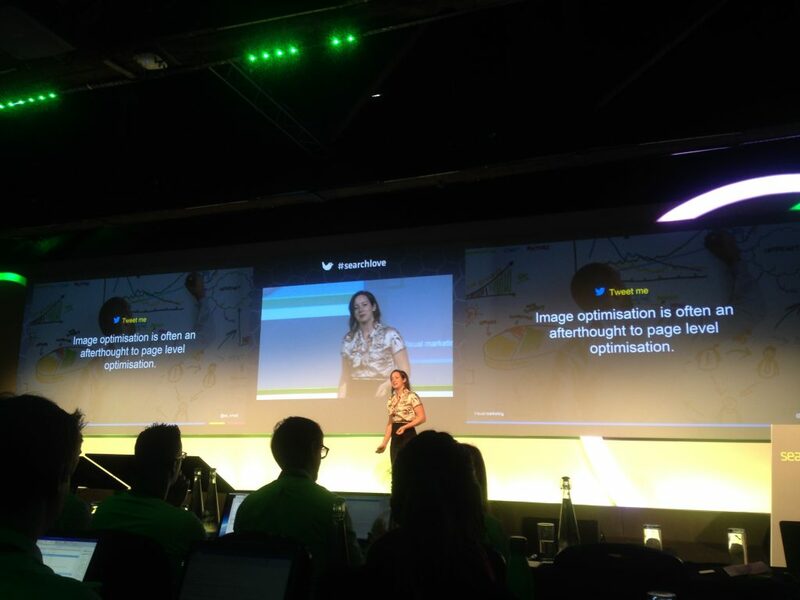 Optimise for image blocks to outrank your competitors in the SERPs. At the moment, a user wants something, they go search for it, then we try to compete. Why are we doing this? When we use image recognition, we can go from desire directly to conversion, skipping the need for search. When we do that, who cares who’s number 1 or who has the highest AdWords budget? The user never sees those things, when we use image recognition. Jes calls is ‘snap to act’. It’s essentially delivering on the promise QR codes made us years ago. But while QR codes were limited to people who knew how to use them, everyone knows how to use a camera phone. Offline, this can be transformative. Imagine if you could take a photo of a billboard and be deep linked to a landing page to buy? Or a magazine article doing the same? Or, bigger still, for a bricks and mortar store, having a window display that people can photograph and buy from can mean your store is open 24/7! If you’re not doing this yet, your competitors could do it instead, and ‘steal’ your customer. This means that a person walking down the street can be a marketing tool. You can literally buy the shirt off someone’s back. Google at their IO this year released Google Lens, which allows people to walk in front of any store front and photograph the signage; it will then show you the local search results in augmented reality. It’s taking away the search box. Your camera becomes your search box. It’s not just Google doing this, either. Brands are doing it too, e.g. Commonwealth Bank in Australia allows you to view property listings by photographing a property. Social networks too are starting to make big moves into visual search. Pinterest is leading this, having repositioned its brand as a visual search engine – searching outside of the box. Pinterest Lens (named before Google’s version) allows you to search using an image and will recommend styles to accompany the pair of shoes you’ve photographer. Pinterest isn’t just doing this with ecommerce. If you take a photo of strawberries, Pinterest knows your don’t want more pictures of strawberries. It recognises that you probably want to know what to do with strawberries, and shows yo recipes instead. Pinterest is going to be powering Target’s visual search functionality in their mobile apps. The only issue here is that 1 in 4 people abandon mobile apps after one use. It’s not in the natural conversion flow, so if you want to do this, think beyond apps. We’re going to a world with digital assistants, chat bots. These are the ones who will be making decisions. You need to think about how you can start integrating within the user’s journey and utilising these technologies. The website as the primary point of conversion is coming to an end. Users are no longer going to be navigating to you or searching for you, when other brands are reaching them at that point of discovery. You need to be there when the customer wants you, don’t make them search for you. Pinterest also has an exclusive partnership with Bixby (Samsung’s assistant). So if you image search with Bixby, you’ll see Pinterest results. Equally, Samsung has partnered with Amazon to fulfil ecommerce queries. Amazon has released Spark recently, too. It fancies itself as a bit of a social network. Spark is about social discovery, helping people to find the products they want through images. Amazon started visual search in 2014 and was the innovator in that area. 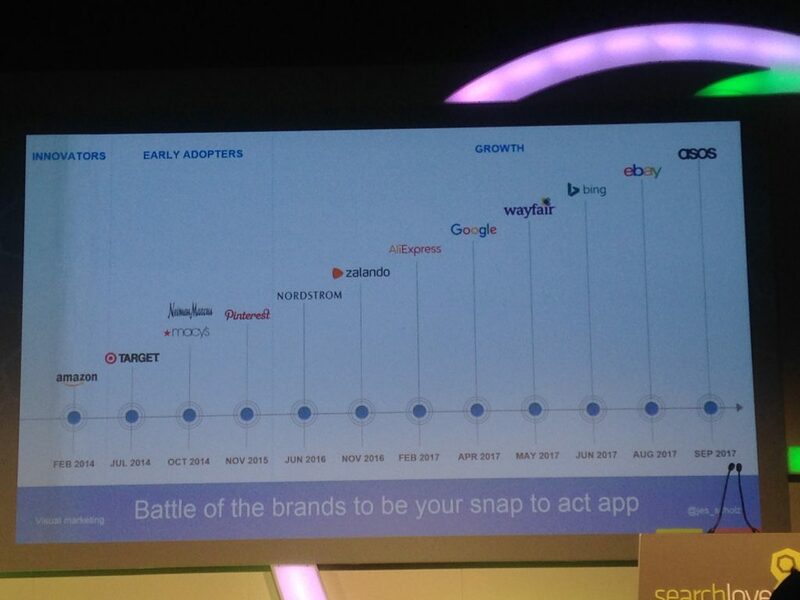 Brands are battling to become your snap-to-act platform. Which means we have consumer brands, social networks and search engines all trying to do this. The only consistent thing between them all is they want to secure your sales. Action: De-prioritise your focus on keywords and start preparing for a time when your camera is your search box. We know that sometimes people see something and want it right away, so we can help that consumer with image optimisation. We can also integrate our image optimisation into smart tech, like assistants and bot. We can use this to track brand advocacy, too. By tracking visual cues, we can see what people think of our brands and identified new opportunities. Stop thinking so much about keywords, and start thinking about pictures.